A totally different take on the Budding Peony stamp set. To date, my cards with this set have been bright and cheerful. The Budding Peony set works as simply elegance as well. I seem to never have Sympathy cards in my stash when needed. Sadly, this one is going in the mail as soon as the ink dries! My card follows the same design as yesterday. A stitched die cut panel popped up with foam tape. I stamped my Budding Peony images in Versamark ink and embossed in silver embossing powder. A few sequins and the card is ready to go. 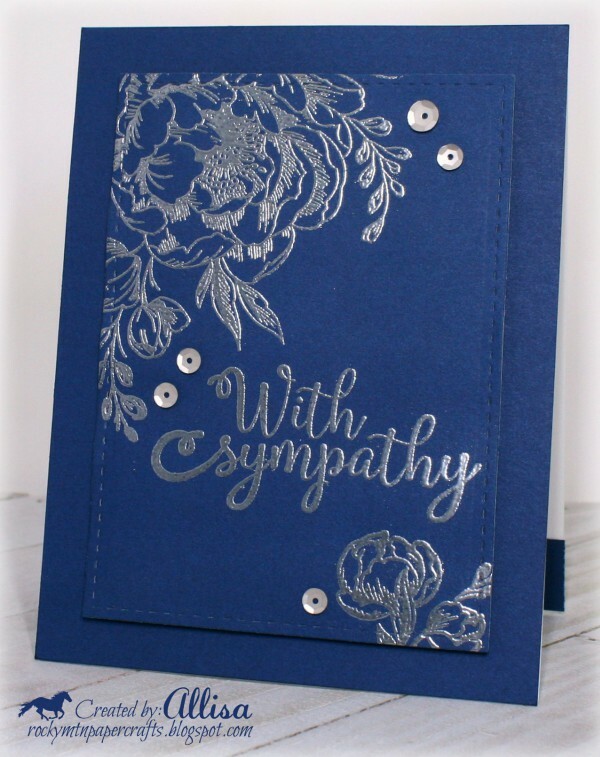 Beautiful sympathy card, love the navy with the silver embossing. Thank you for joining us at Daring Cardmakers this week.